It came to my attention in August 2016 that Rhodia/Solvay were erecting posts on the North embankment at Rattlechain Lagoon. 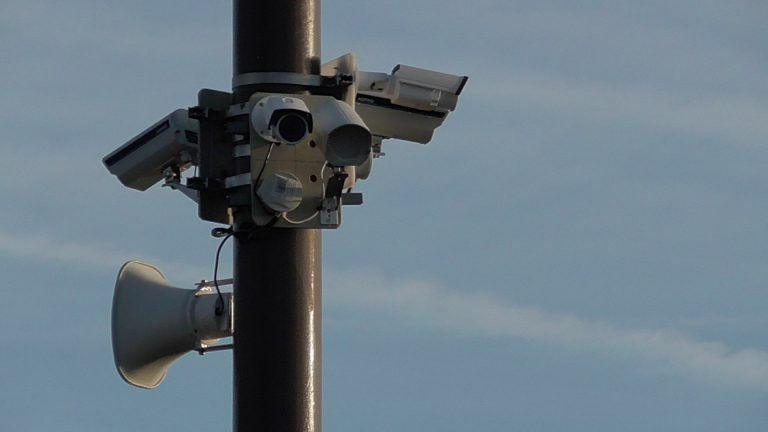 It subsequently transpired that these were camera mounts with security cameras later being attached, and as well as this additional cameras at the main entrance which had received permission in 2010 were also attached to that post. It was noted in this application that further cameras would require additional planning consent. It was clear that no consent had been obtained to erect these posts or the additional cameras, and this was confirmed by Sandwell Council’s planning enforcement officer Alison Bishop. Rhodia then submitted a retrospective application numbered DC/17/60912. Subsequently Rhodia received permission from Sandwell council retrospectively for these additional cameras, yet it was a permission confused and waived through without any real scrutiny by chief executive Jan Britton. There were some unanswered questions about the application and the purpose of the company in erecting additional cameras at this still “hazardous waste site” a fact incredibly omitted from their application. Q 1Please confirm if the company Rhodia/Solvay paid a planning fee, and what this was? Q2 Reference is made in the application to a speaker system capable of 113 decibels, yet no evidence of this is supplied with the application. Please disclose where Sandwell council took this information from. Q3 Disclose what evidence you have that cameras located next to houses in Callaghan drive added with this application have been “electronically blanked out” , as claimed in the application? next to Callaghan Drive have been digitally masked so the privacy of residents cannot be compromised. Q4 Please disclose all correspondence with Rhodia/Solvay in relation to this application, and threat of enforcement action. The following information is attached: (a) Email to Rhodia regarding the unauthorised structure on 21st July 2017. I have still not received a retrospective application for these unauthorised structures. If we do not receive an application by the end of August, then I shall instigate enforcement proceedings. (i) In our earlier email correspondence it was stated that the cameras were required due to break-ins. Can you provide records of these occurrences? (ii) You state that the cameras are non pivotal with zoom lenses. Please confirm that the cameras that this means the cameras are fixed facing towards the lagoon and not towards the canal. Please confirm the zoom distances to establish that the privacy of properties on Callaghan Drive will not be compromised? (iii) Please confirm how the speaker is activated the decibels of sound? I would be grateful if you could provide this information no later than Tuesday 5th September. Please see below answers to questions. Photographic evidence of major damage to Rattlechain North Banks due to “bottle collectors” entering the site via the top boundary fence, this particular damage being done, following new earth works, 23/11/15 and 03/11/16. Note, prior to the new earth works / re-landscaping, “bottle collectors” have entered the site on in February and June 2105, causing damage to the boundary fence and mainly round the top bank. Following camera installation, no trespass has occurred. The camera’s are non pivotal and are facing along the middle bank adjacent to the lagoon. The camera mountings close to Callaghan drive have been digitally masked and the privacy to the properties cannot be compromised. The speaker attached to the 4mtr column on the North Bank is manually operated by “Robowatch” control center observing the area only and is not automated , if intruders are observed, the operative speaks out to say that they are being tracked and gives a description of what they are wearing, to prove that it is not an automated voice recording and to leave the site immediately . The speaker volume is rated at 113 decibels. checking our records application is listed within these delegated decisions for the Planning Committee of 4th October 2017, please see attached copy. In terms of the planning fee, I am glad that this multinational billion pound company have now coughed up the dough they attempted to dodge. The decibel level of the speaker system has not been heard by myself, and I am unaware of what would exactly happen if anyone was to enter the site. Why does she not get that this application was for the additional cameras at the front entrance as well as the two new ones on posts on The North Embankment? There is still no explanation as to why additional cameras were needed at the main John’s Lane entrance if the claimed damage to the North embankment was happening at that end of the site. Presumably no one was gaining access from the main John’s Lane gate which was already covered by the pole mounted pivoting camera? In terms of the enforcement action it is noted that in the first instance Alison Bishop emails “Tom”- obviously Tom Dutton the HSE manager at Rhodia no doubt on 21st July 2016. However subsequently Jason Williams “Mechanical Integrity & Plant Engineer – Oldbury” is contacted by Alsion Bishop on 30 August 2017 which appears to suggest that some other form of correspondence existed between SMBC and Rhodia/Solvay and has not been included in this request. “I intend to visit the site on Friday….” writes Alison Bishop which suggests that Rhodia had previously asked if she wanted to visit the site and when. It is disappointing that SMBC have clearly not disclosed “ALL the correspondence with Rhodia/Solvay in relation to this application” as requested. There are questions which arise from some of the answers to Alison Bishop’s questions. Firstly the idea that “bottle diggers” were responsible for causing the alleged damage to the banks. The supplied picture shows a bottle lying right next to the Rhodia employee- perhaps Mr Williams? Obviously if the intruders were after bottles then they must be rather picky to have left this one behind? I am also confused as to how Rhodia/Solvay appear to know that the alleged intruders were after bottles if the existing camera at the main entrance which has full zoom lenses capabilities back to their concierge at Trinity Street did not pick up them up digging. Why did Rhodia not disclose this evidence of people actually on the site on the known dates which are very specific to Alison Bishop? Presumably they gave it to West Midlands police and reported the damage to them? The lack of presented evidence of trespassers and what they were actually doing concerns me- particularly as it could amount to wildlife crime and not bottle digging- that is if there were any real trespassers at all and this was not some form of fault with the bank works themselves? The lack of real description about the nature of this hazardous waste site- By Jason Williams as applicant on the form is what concerns me most. If they had been honest about WHY these cameras are beneficial- IE BECAUSE OF THE NATURE OF THE HAZARDOUS WASTE IN THE SITE, then I would not have pursued this matter any further. BUT THIS IS RHODIA and as I know well, they keep it all in not only with their toxic waste, but also in what they disclose to both regulators and the public- and unfortunately like with this application they usually get away without giving any real answers under poor cross examination.